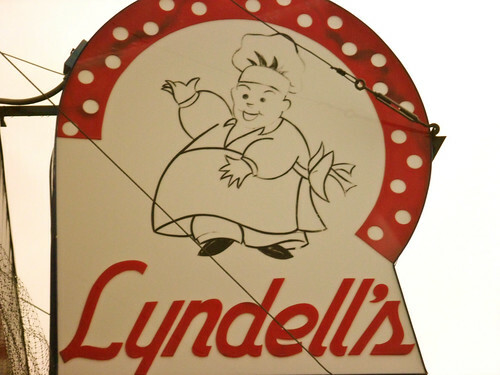 :: The baker on the sign at Lyndell’s bakery is cheerful in spite of the dreary weather. He lures you in with his slightly crazed laugh. “Come in! Come in! There are cupcakes inside…. !” You really dare not refuse. Unless you don’t want a cupcake. Now that’s a laugh. 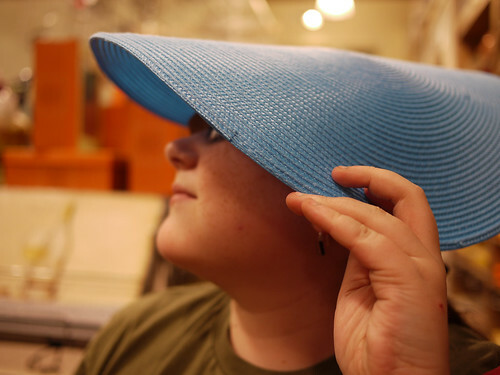 :: Who knew that a placemat made such a lovely hat? 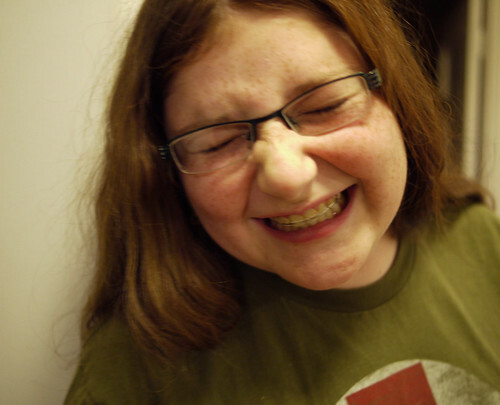 Who knew that H’s mother could take an infocus picture when she was giggling so hard? 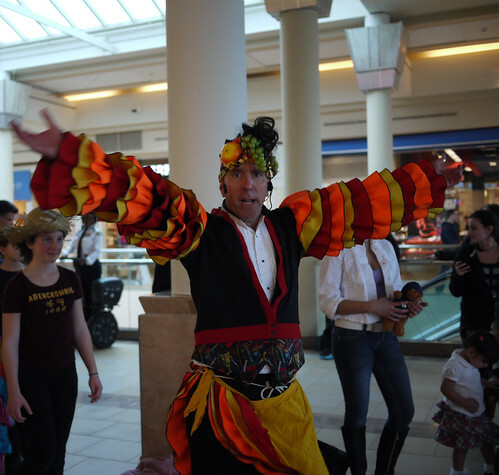 :: When you catch the Flamenco Mall Man dancing on film, he is not laughing. Oh no. He is a bit startled. But you are laughing as you run to the escalator, hoping he doesn’t chase you. :: When a poodle licks the palm of your hand, for five minutes straight, you can’t help but laugh. And then everyone else in the house starts laughing. And the only one who isn’t laughing is the poodle, because he’s got an important job to do: lick lick lick lick. 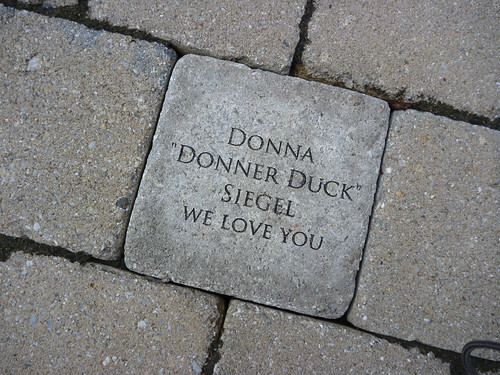 :: Sure, we could have requested a sweet, serious quote like all the other families who placed a paver in memory or honor of their mothers on the Rose Kennedy Mother’s Walk, but that’s not how you raised us, Mom. Instead, we like to think about a family strolling down the path, reading the sweetly phrased pavers (“Our Cherished Mother”, “We’ll Never Forget You Mother”, “From Your Loving Children”), maybe feeling a bit melancholy, and then coming to this one, and cracking a smile. And when they do, they can thank you, Mom. Next Post Wordless Wednesday ~ Happy Gambol Day! How fun! Beginning to end, I smiled…and that paving stone is precious and beautiful. Love that smile of H’s and the hat!! Sounds like a great time was had by all!